The event planning landscape is competitive, with countless new individuals and agencies getting into the mix each year — and, at the same time, vying to differentiate themselves from the competition. 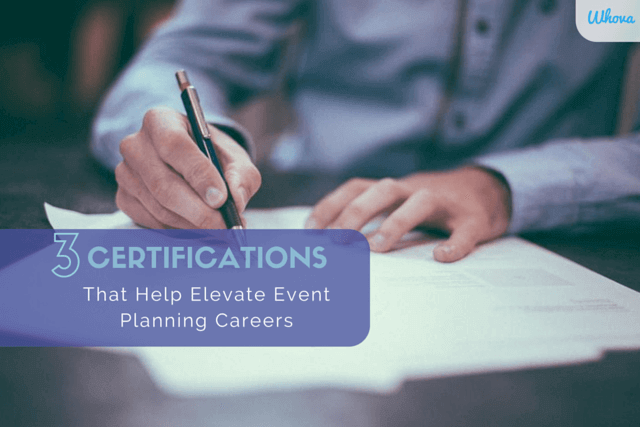 As a result, several industry-specific certification programs have popped up in recent years, each offering hands-on training, support and accreditation for serious event and conference planners. While the most renowned programs require significant commitment in terms of in-class, virtual and/or independent work, the payoff can be immediate and immeasurable. The Certified Special Event Professional (CSEP) designation, the Certified Meeting Professional certification from the Convention Industry Council (CIC) and the Certified Meeting Planner program from Meeting Planners International (MPI) are three of the most sought-after distinctions in event planning. Designed for experienced professionals with at least three to five years on the job, these tracks each focus on expanding existing knowledge while exploring trends and tackling a wide variety skills-based trainings and assessments. The benefit to undertaking these renowned certification processes is simple: they’re globally recognized and acknowledge “graduates” have a high level of expertise, skills, knowledge and commitment. As a result, these certificates can be significant competitive advantages showing that planners, through their rigorous training and in-market work, have gained the high level of understanding and achievement necessary to excel. The drawback? All require some level of independent or group study, followed by in-depth exams. What’s more, fees can be hefty especially for solo planners who are funding certification programs on their own. A successful end result, though — passing the tests and earning your certifications — can have endless value in the short- and long-term, helping planners earn more, generate increased business and secure top jobs with planning agencies and individual clients. Ideal for new and established planners, several well-known online certifications have emerged in recent years, offering more flexible training and testing processes. The QC Event School, for example, offers four tracks spanning both corporate events and wedding planning. Each, program, the school touts, “provides you with the professional training, practical experience and industry-recognized certification you need” to branch out into a solo or corporate event position. Likewise, EVENTful Ventures offers a popular video/eBook-based program that delves into everything from how to get started to maximizing an existing planning career with infinite flexibility to work through sessions and takeaways over a week, a month, a year or, even, more. Because these programs are online-only, work is done at students’ individual paces. What’s more, with no physical campuses or other traditional overhead costs, fees for these certification programs are much lower than other training hubs. QC’s programs begin at just $81 per month, while EVENTful’s video/eBook pairing comes in just under $300. The biggest stumbling block, then? There’s little accountability with these programs since participants are free from professors, trainers and scheduled assignments or exams. While there can be great takeaways for self-motivated professionals, it can be easy to fall behind — and with no test at the end, there’s no real drawback to slipping off track during the process. One final word of caution: if you’re considering an online program, be sure to confirm they offer a form certification or other designation upon completion. While you may gain valuable insights and next steps with or without a formal certificate, many planners and agencies want to tout their achievements — and that means proudly displaying or listing their certifications online and in sales collateral. Kicking off a meeting, conference or event planning career? The best place to start is, often, with a local college- or university-based training program. While most schools don’t offer event planning-based majors or minors, many offer targeted coursework and certification programs in niche areas of the industry — and having those high profile achievements on your resume, website or signature can help boost your business in a big way. Some good examples? University of San Diego’s Continuing Education department offers one of the premier event planning certifications in the country. This six-course program walks students through the entire process of career event planning, from coordinating and producing programming to specific areas such as audio visual, catering, risk management and more. New York University’s School of Continuing and Professional Studies offers a similar non-credit Professional Diploma in Meeting and Convention Management. This intensive includes a four-part in-class series plus a capstone portfolio review to gauge ability and understanding. The upside to these programs is clear: by tapping into extensive training, industry-leading professional teachers and mentors and hands-on support, planners gain the skills they need to get ahead. And, because many of these programs are anchored by well-regarded schools, clients and companies are eager to hire emerging planners. The only drawbacks are, typically, tied to costs — programs can run from a few hundred dollars to thousands of dollars — and the in-class mandate. While some collegiate programs have online coursework, the vast majority require at least some on-campus time. Depending on your schedule and proximity to certificate-granting schools, this can be challenging. No matter where you are in your event career, quality certification and training programs can be a major boost, positioning you as a knowledgeable, professional and highly committed planner. Whether you opt for a traditional program with a respected industry organization, a self-paced online program or a certification process at a local college or university, you’re positioning yourself for success now and in the future. By honing your skills, networking with other pros and gaining valuable industry insights and tactics you’re making yourself not just more marketable but, also, more adept at tackling the unique challenges event planners face day after day. Now we want to hear from YOU: do you have any event certifications or professional training under your belt? Which do you feel were the most valuable? What program would you recommend to an event newcomer or aspiring planner?